With Friendship Day coming up (5th August), it’s high time to think of that one person in your squad who is there for you above everyone else. So, with that said, we’ve put together some of our favourite ideas to help you celebrate friendship day. We’re always craving some time to unwind and pamper ourselves. Whether it’s beautifying our skin or giving our hair some much needed tlc (we know a thing or two on this topic by the way), treating yourself to some decent pamper time with your bestie is always a good option. Indulge your hair with a nourishing mask treatment and rejuvenate your skin with an exfoliating mask. Speak to one of our stylists for the best products for you. You could even combine your pamper day and date night. Bliss. Nothing beats good old-fashioned retail therapy. There’s a reason they call it retail-therapy. 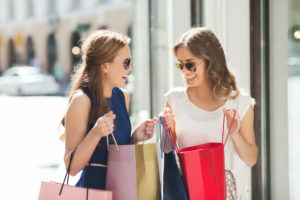 According to studies shopping allows us to be creative and provides us with the joy and excitement of visualising how we’d use our newly bought items. It also allows us to socially connect with others which can help alleviate daily stresses. But there’s a cautionary notice of over-indulgence attached with this one – so be mindful! With that said, set your budget with your gal and shop away your stresses together. The world is such a big place and who better to explore it with than your bestie? Okay, so our budget might not exactly stretch to a 5* thrill seeking adventure get away in Bali, but hey, we bet there’s places right on your door step that you never even knew existed. What about that new bar you drive past every morning thinking “I need to check that place out” but never actually get around to doing it? Or taking that road trip up to the place you and your mate have been talking about for like a decade? Well, it’s about time you did something about it! Grab your picnic basket, some moisturising SPF protection, your retro hair scarf to keep your mane in tact on the open road plus your fav shades, you know, those rose-tinted heart shaped ones, and hit the road this summer. Tell us how you’re spending your friendship day by tagging us @Regissalons and using the hashtag #Regissalons Better yet, visit a salon near you with your mate and take part in our competition using #RegisFriendship and win that spa day!